Designed for demanding CAD, GIS, engineering, textile and apparel applications, the DrawingBoard VI series is the design professional’s choice in large-format digitizers. DrawingBoard VI systems feature integrated USB and RS-232 Serial connections. When connected through a USB, no power supply is required simplifying setup and operation. DrawingBoard VI digitizers utilizes high-performance tools engineered with a state-of-the-art positioning grid to ensure reliability, performance and quality. Multiple accuracy versions are available to match specific system requirements and an integrated mounting channel allows accessories, such as a pen tray, to be easily and quickly mounted. DrawingBoard VI digitizers work with a variety of cursors and stylus pens. This large-format digitizer offers greater flexibility and patented sensing technology for enhanced performance of high-quality blueprints. An integrated USB connection allows Super L VI to be powered through any PC, providing access to industry-leading software programs. Incorporate GTCO CalComp’s SuperSet Menu for simple and fast navigation between applications. Customize Super L VI by selecting from a variety of corded or cordless transducers. Super L VI’s advanced driver set, provided on CD in a user-friendly interface, makes setup even easier. Custom configurations, previously available through the tablet hardware, are accessible through a software configuration program that supports emulations of popular industry formats, including CalComp 3400 and Summagrid. Transform any environment into a collaborative workspace. The Roll-Up III digitizer series offers complete mobility and is engineered with GTCO CalComp’s exclusive patented Redundant Grid Technology™ for greater durability and ruggedness. 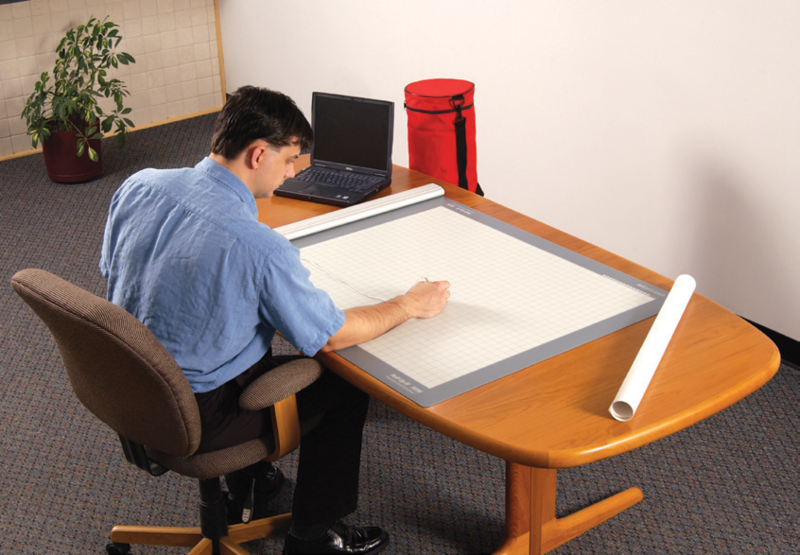 Simple setup makes the Roll-Up III versatile for use in the office or in the field. Portable, lightweight Roll-Up III digitizers are only 0.078 in / 2.0 mm thick allowing them to be easily rolled for storage or transport to various task sites. Constructed with advanced materials, including a tough Lexan® work surface, Roll-Up III digitizers lay flat, maintain a smooth work surface and feature flexible dual orientation that allows the controller housing to be configured on the right or left edge of the digitizer. Roll-Up III is available with a variety of pointing devices including a pen-shaped stylus-ideal for quantity takeoffs and the accurate 4 and 16-button MaxVu™ cursors, which feature a wide viewing area for precise digitizing. Enhance the quality and accuracy of designs through illumination with Surface-Lit DrawingBoard. The innovative large-format digitizer features a thin panel of LED backlighting engineered for superior clarity and guarantees the highest level of data integrity available today. Surface-Lit DrawingBoard utilizes high-performance tools engineered with a state-of-the-art positioning grid to ensure reliability, precision and value. An integrated mounting channel allows accessories such as a pen tray to be easily and quickly mounted. Surface-Lit DrawingBoard also encompasses a cool working surface that uses less than half the energy of conventional back-lit tablets. VersaTable is the perfect companion for DrawingBoard VI and Super L VI digitizers. This easy-to-install pedestal provides greater functionality and a stable platform for precise and superior designs. All components are adjustable to suit personal preference.